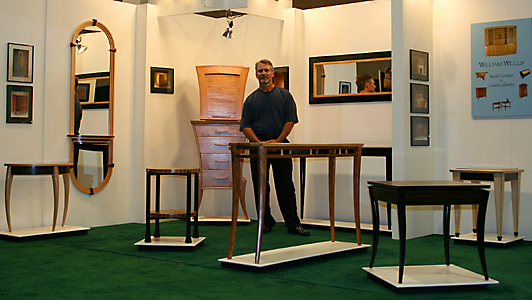 cherry table was featured in the June 2010 Fine Woodworking Reader’s Gallery. page). For book information click here. Please check periodically as we schedule new shows and events. The most important thing to me is getting clients involved in creating their personal piece of handmade furniture, because the only thing better than having a custom-made piece of furniture is knowing you were directly involved in its creation. My creative process starts with a drawing, which the client reviews. Once we agree on a design, I construct a 1/8 scale model of the piece. 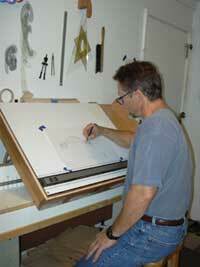 While drawings are nice, they don’t always give a true impression of the piece, especially when curves are involved. I’ve done drawings that looked great, but after making the model I’ll see something that’s not pleasing — perhaps a proportion isn’t quite right. It’s easier to make changes on a model than a finished piece, so this gives me the opportunity to make necessary alterations. To keep clients involved in the creative process, I e-mail a digital photo of the model. That way customers know what the piece will look like before we proceed. During construction, if clients are interested, I’ll continue e-mailing digital photos so they can see how their piece is progressing. 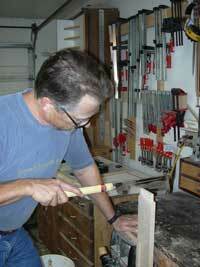 Construction is always done using traditional joinery — the mortise, tenon and dovetail are my favorites. I love what I do, and I won’t be happy until I know you have a special piece of furniture you’ll cherish for generations.